Into the Studio for a few hours this afternoon to finish up this first batch of postcards. I trimmed them all to the precise required size- 148 mm x 210 mm. (a European standard size I'm told) . 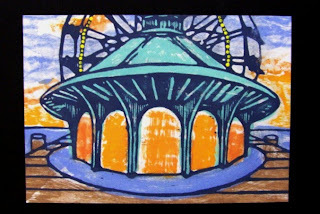 After that the final touch, little dots of lemon yellow silkscreen ink along parts of the Ferris wheel, applied with the back end of a small paintbrush. Below is an example of a completed card. (*) It is my custom to label the last posting of an in-progress print as "Finished", but since the image is destined to be added to by another artist, technically this piece is only half finished. I left 9 of the cards on my work table, and walked one up the street to the Ocean Grove post office. I had done a little research online in the morning, but I wanted to get an answer right from the source. Once I explained what I wanted to do and where Mauritius is, I was able to confirm that the cost of mailing this card will be 98 cents. By the time I got back to the Studio the yellow ink was dry on all the cards. One will be sent halfway around the world this week, I'll save a backup copy in case the first card has issues in transit, and a third will be retained as a color reference for future printings. The rest will be distributed to interested local artists (the critique group mostly) to see what kind of collaborative ideas they come up with.